Where can I buy the digital version of Gantz manga? I searched in Dark Horse Comics site but they don't have the digital version. Amazon also just has the Physical version. Does Gantz not have a digital version of the manga? Short answer, NO, there's no digital version of the US release of the GANTZ manga. This is 6 months AFTER the last volume was physically released in Japan, which came out on August 19th, 2013. All the volumes were released in bulk on bookwalker that very same day. The link here will take you to the full list of the GANTZ releases (site is in japanese). Nowadays, more and more older series are getting digital releases in Japan. 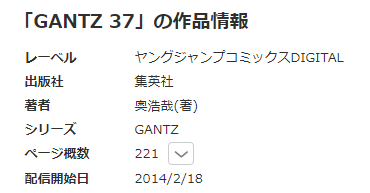 Which means that there was NO digital release of GANTZ in Japan back in 2007 when Dark Horse made the license deal. IF their original deal had contemplated the future possibility of digital releases in Japan, Dark Horse could legally sell the digital version, but there's been no such release so far so either they don't care or they can't release digitally without another deal. Not the answer you're looking for? Browse other questions tagged merchandise gantz or ask your own question.